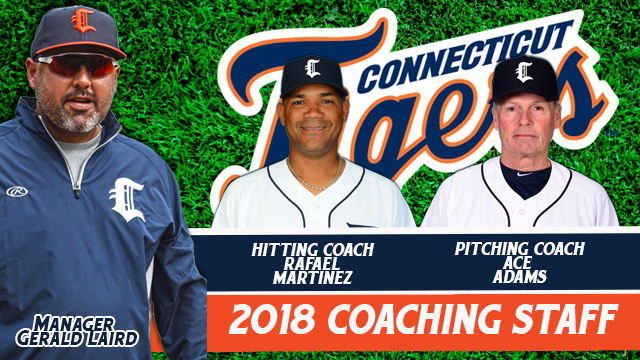 NORWICH, CT- The Connecticut Tigers, in conjunction with the Detroit Tigers, today announce their 2018 coaching staff. The Tigers will once again be Managed by MLB veteran catcher Gerald Laird. The 2018 season kicks off Friday, June 15th at Dodd Stadium as the Tigers take on the Lowell Spinners (Red Sox affiliate) with fireworks following the game! Returning to the helm in Norwich is 13-year MLB veteran catcher Gerald Laird. In his first coaching assignment, Laird led the Tigers to a 37-35 season in 2017. The Tigers finished 3.5 games out of first place in the Stedler Division behind the Vermont Lake Monsters. The Garden Grove, California native was drafted by the Oakland Athletics in the 2nd round of the 1998 amateur draft and made his MLB debut in 2003 with the Texas Rangers. He went on to play 799 games for the Rangers, Tigers, Cardinals, Braves, and Diamondbacks. Laird was a member of the 2012 American League champion Detroit Tigers and the 2011 World Series champion St. Louis Cardinals. Returning to the Connecticut staff for his third season is Pitching Coach Ace Adams. Adams is a native of Longmeadow, Massachusetts and has over 30 years of coaching experience at both the collegiate and professional level. Ace was a collegiate assistant at the University of Michigan, Brandeis University, Harvard University and Dartmouth College before coaching assignments in the Expos, Marlins, Red Sox, Cardinals, and Astros organizations. Hitting Coach Rafael Martinez will also return to the Tigers staff for his second season in Norwich. Having served as Manager of the Dominican Summer League Tigers from 2011-2015 and the Gulf Coast League Tigers in 2016, the Santo Domingo, Dominican Republic native is entering his 13th season as a coach in the Detroit Tigers organization. Joining the staff for the first time in 2018 will be Athletic Trainer Sean McFarland. 2018 marks the Wind Lake, Wisconsin native's second season with the Detroit Tigers organization, having served as an Athletic Trainer for the Gulf Coast League Tigers in 2017. 2018 will be Strength & Conditioning Coach Edwin Ortiz's second season in Norwich and third overall with the Tigers organization, having served in the same role for the Gulf Coast League Tigers in 2016 and since 2013 for the Indios de Mayaguez in Puerto Rico's Liga de Beisbol Profesional Roberto Clemente. The Connecticut Tigers are the New York-Penn League affiliate of the Detroit Tigers at Dodd Stadium in Norwich, Connecticut. 2018 season memberships for "The Club", mini plans, and team merchandise are now on sale! The front office and box office is open daily from 9 am to 5 pm Monday through Friday and can be accessed in person or by calling 860-887-7962.